I got a question about the feasibility of porting Rhino Queues to Silverlight, but that isn’t really something that can fit in that scenario. So I set down to write the design for a Silverlight queuing system. Just to be clear, I have no intention currently to actually build this at this time (well, not unless someone is willing to pay for it or I get a project that requires it). This is merely a way to get the design problem off my head. Why can’t we just port Rhino Queues to Silverlight? There are two reasons, one is technical, the second relates to the different way that Silverlight applications are used. The first problem is that Rhino Queues requires a way to listen to incoming messages, but Silverlight offers no way of doing such (reasonably so, FWIW, since that would turn the Silverlight app to a server, and there are probably security issues with that). The second problem is simply that the way most Silverlight solutions are structured, there is going to be a WAN between the Silverlight app and the server, and WAN between each client. 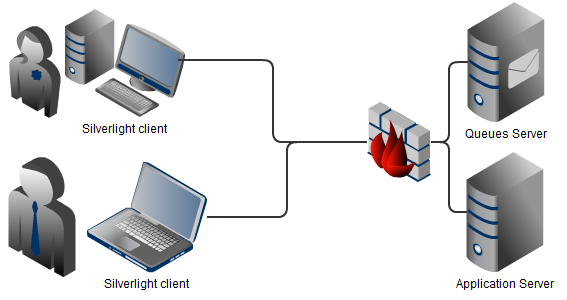 Direct connections between the Server & Silverlight client is likely to be possible only when using HTTP, and there isn’t going to be any direct communication between different clients. Rhino Queues is built on the notion of independent agents, each of them containing a full queuing stack. That model will not work for Silverlight. In Silverlight, we need to support all the usual queuing features, but each agent (Silverlight application) is no longer independent. The Silverlight Queues model will be slightly different. We introduce a Queues server component which will hold the queues & messages internally. A background thread send the messages from isolated storage to the Queues server. A background thread periodically pools (an alternative is a Comet using something like WebSync) the server for new messages. The Silverlight acknowledge the receipt of the messages. There are some twists here, though. Each Silverlight application has its own “queue” in the Queues server. That allows a one-way messaging platform with point to point notification. That is likely to be common in Silverlight applications that handle business transactions. Topics, in addition to a queue per client, we might also want to allow subscription to topics, for example, I may be interested in getting notifications when the system settings have changed. That is something that is shared among all (or a lot) of clients. The Queues server should support this as well. Yes, I know that this is a very high level design, but there really isn’t much here that I can call very complex. How much interest is there in Queuing system in Silverlight? I tried to tackle the same thing in CTP3, but I was unable to resolve it. Using CTP4, it was about as easy as I could wish it. Just for fun, the following screen shot looks like it contains a bug, but it doesn’t (at least, not to my knowledge). 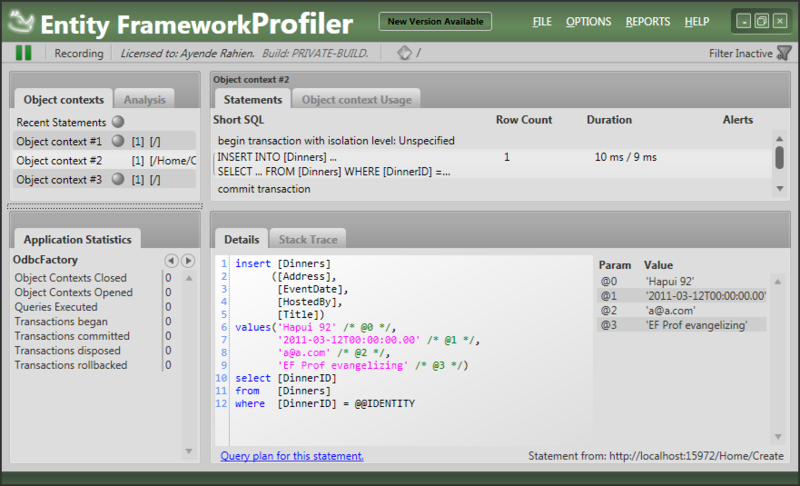 If you can spot what the bug is, I am going to hand you a 25% discount coupon for EF Prof. If you can tell me why it is not a bug, I would double that. As an aside, am I the only one that is bothered by the use of @@IDNETITY by EF? I thought that we weren’t supposed to make use of that. Moreover, why write this complex statement when you can write SELECT @@IDENTITY? What is the impact of reflection on NHibernate’s performance? I started to answer that there isn’t one that you would notice, even beyond the major optimizations that NH had in that role, you are accessing a remote database, which is much more expensive. But then they told me that they profiled the application and found some stuff there about that. To be fair, they actually had a reasonable reason to want to do that. I disagree with the solution that they had, but it was a reasonable approach to the problem at hand. 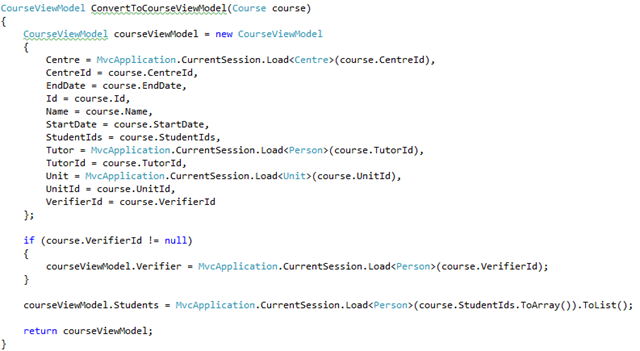 This is a RavenDB application whose existence I learned about roughly an hour ago. 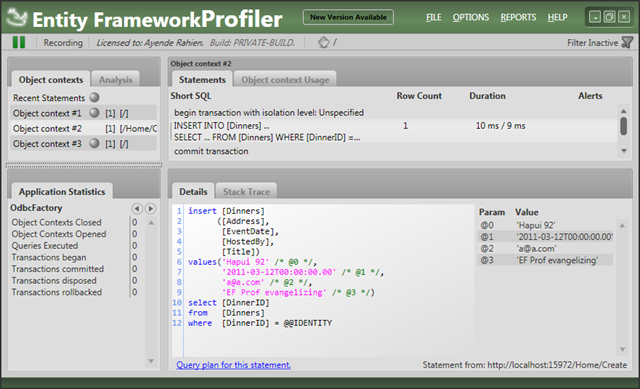 The following is a typical code review about the application, not limited to just RavenDB. When I first opened the solution, I was very happy to see that there are tests for the application, but I was disappointed when I actually opened it. The only tests that exists seems to be the default ones that comes with ASP.Net MVC. I would rather have no test project than a test project like that. Annoyed with the test project, I headed for my favorite target for frustration, the MVC AccountController and its horrid attempt at creating DI or abstractions. Yes, simple, work, simple, uncomplicated! You don’t have to think when reading this code, I like it. That is how the Account Controller should have been, by default. This is essentially a lookup class. 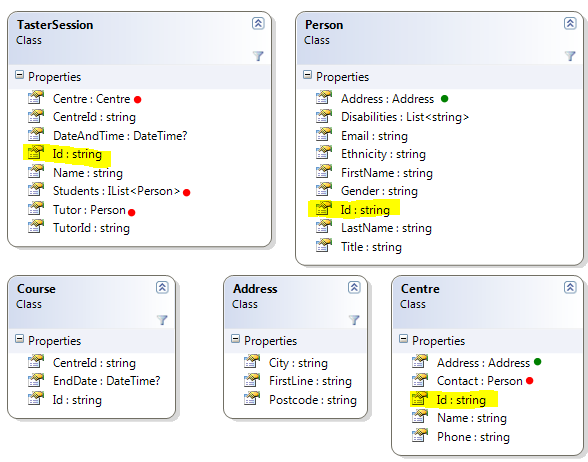 The classes with the Id property (highlighted) are presumed to be Root Entities (in other words, they would each reside in their own document). I am not absolutely sure that this is the case yet, but I am sure enough to point out a potential problem. Did you notice that we have references to things like Address, Person and Centre in the model? They are marked with red and green points. 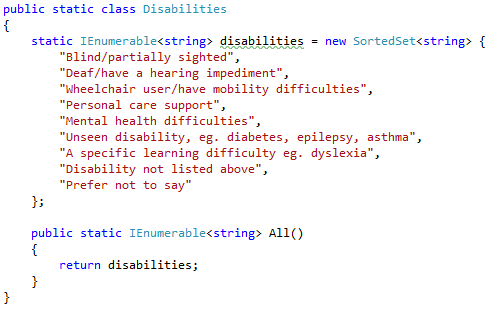 A green point is when we reference a class that doesn’t have an id, and is therefore considered to be a value type which is embedded in the parent document. A red point, however, indicate what I believe will be a common problem for people coming to RavenDB from an OR/M background. RavenDB doesn’t support references (this is by design), and the result of referencing a Root Entity in another Root Entity is that the referenced entity is embedded inside the referencing document. This is precisely what you want for value types like Address, and precisely what you don’t want for references. 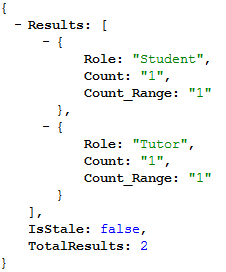 You can see in TasterSession that there are actually two references to Tutor, one for the Tutor data and one for the TutorId. I think that this is an indication for hitting that problem. For myself, I would prefer to not denormalize the entire referenced entity, but only key properties that are needed for processing the referencing entity. That make is easier to understand the distinction between the Person instance that is mapped to people/4955 and the Person instance that is help in Centre.Contact. 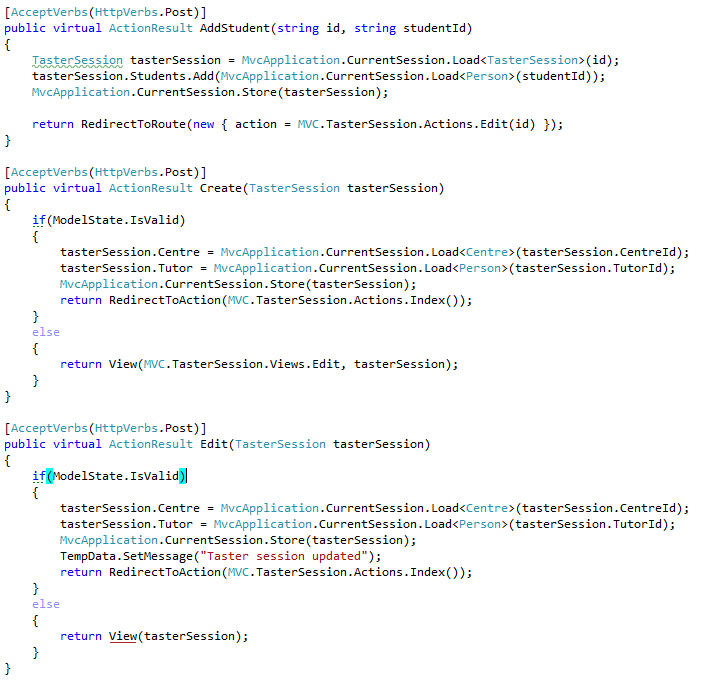 This is great, we have a session per request, which is what I would expect in a we application. I might quibble with the call to SaveChanges, though. I like to make that one an explicit one, rather than implicit, but that is just that, a quibble. 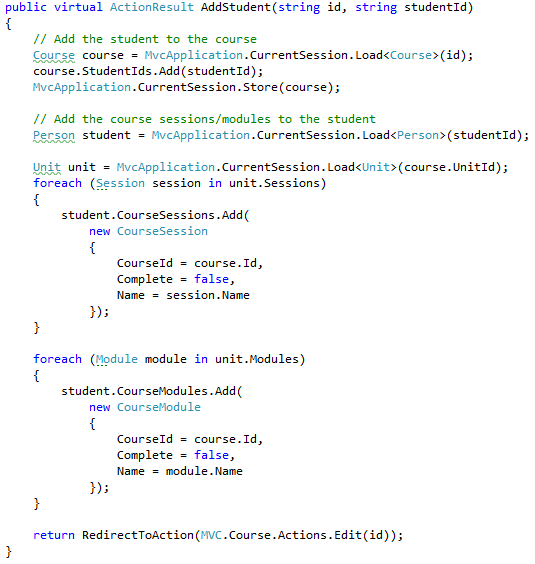 RavenDB is pretty conventional, and Community Courses override one of those conventions to make it easier to work with MVC. By default, RavenDB will use ids like: “people/391”, “centres/912”, by changing the identity parts separator, it will ids like: “people-952”, “centres-1923”. 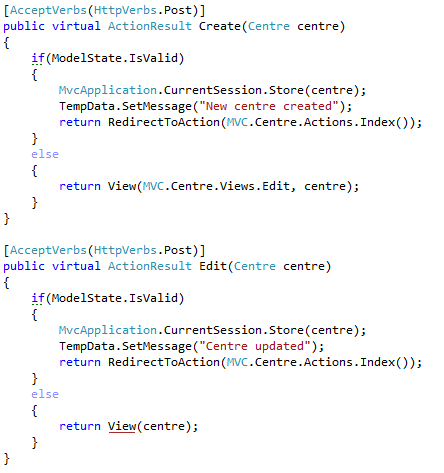 The later are easier to work with in MVC because they don’t contain a routing character. Those are all pretty simple. The only thing of real interest is the Index action, which uses a query on an index to get the results. Currently the application doesn’t support paging, but it probably should, which wouldn’t complicate like all that much (adding Skip & Take, that is about it). They are short & to the point, nothing much to do here. 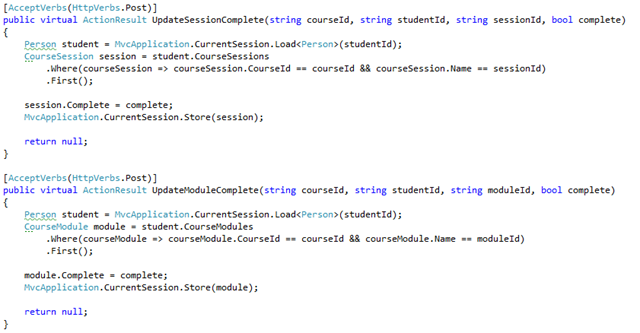 I like this style of coding very much. You could fall asleep while writing it. The only comment beyond that is that those methods are so similar that I would consider merging them into a single action. This is slightly more complex, but I think that the benefits outweigh the additional complexity. 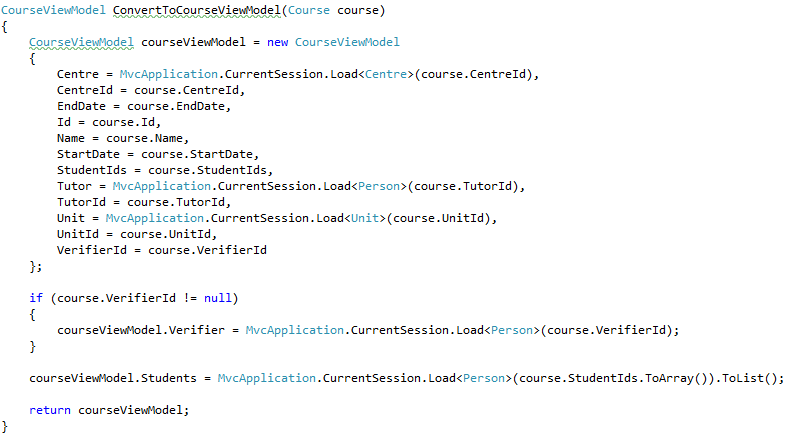 It is going to cause a problem because it makes a single remote call (the Query) and for every result from this query it is going to perform 5 remote calls inside ConvertToCourseViewModel. Using this approach, we can handle the Index action shown above with a single remote call. And that is much better. This is an excellent example of how things should be. (Well, almost, I would remove the unnecessary Store call and move the StudentIds.Add just before the foreach, so all the data access happens first, it makes it easier to scan). Using an OR/M, this code would generate 8 remote calls, but because Raven’s documents are loaded as a single unit, we have only 3 here (and if we really wanted, we can drop it to one). 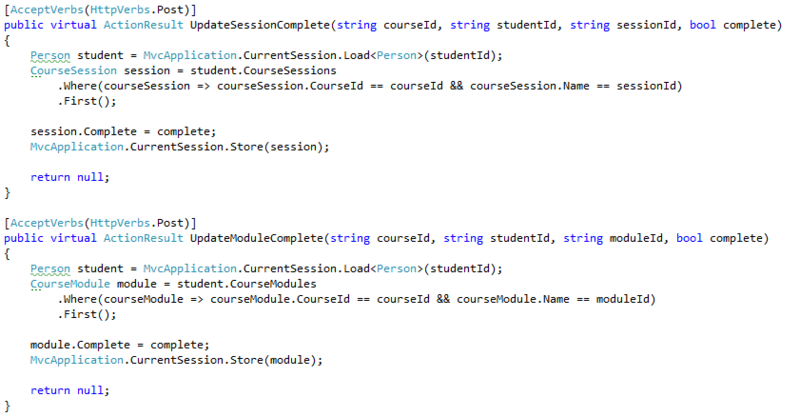 Next, we update a particular session / module in a student. We can drop the unnecessary calls to Store, but beside that, it is pretty code. I don’t like that moduleId / sessionId are compared to the Name property, That seems confusing to me. I sincerely hope that those comments were generated by a tool. References in RavenDB are always embedded in the referencing entity. This should be a denomralized reference instead (just Id & Name, most probably). I focused exclusively on the controller / Raven code, and paid absolutely no attention to any UI / JS / View code. I can tell you that the UI looks & behaves really nice, but that is about it. All in all, this was a codebase that was a pleasure to read. There are some problems, but they are going to be easy to fix. I used to be able to just sit down and write some code, and eventually things would work. Just In Time Design. That is how I wrote things like Rhino Mocks, for example. Several years ago (2007, to be exact) I started doing more detailed upfront design, those designs aren’t curved in stone, but they are helpful in setting everything in motion properly. Of course, in some cases those design need a lot of time to percolate. At any rate, this is the design for the Authorization Bundle for RavenDB. I would welcome any comments about it. I gave some background on some of the guiding thoughts about the subject in this post. Note: This design is written before the code, it reflect the general principles of how I intend to approach the problem, but it is not a binding design, things will change. Rhino Security design has affected the design of this system heavily. In essence, this is a port (of a sort) of Rhino Security to RavenDB, with the necessary changes to make the move to a NoSQL database. I am pretty happy with the design and I actually think that we might do back porting to Rhino Security at some point. In other words, only the application server can talk to the RavenDB server and the application server is running trusted code. To be clear, this design doesn’t not apply if users can connect directly to the database and lie about who they are. However, that scenario is expected to crop up, even though it is out of scope for the current version. Our design need to be future proofed in that regard. Since we can trust the client calling us, we can rely on the client to tell us which user a particular action is executed on behalf of, and what is the context of the operation. The user specified is using the reserved namespace “raven/”. This allows the authorization bundle to have a well known format for the users documents. The operation specified is using the Rhino Security conventions for operations. By using this format, we can easily construct hierarchical permissions. The format isn’t what an application needs for a User document. This entry is meant for the authorization bundle’s use, not for an application’s use. You can use the same format for both, of course, by extending the authorization user document, but I’ll ignore this for now. Note that the Roles that we have are hierarchical as well. This is important, since we would use that when defining permissions. Beyond that, Roles are used in a similar manner to groups in something like Active Directory. 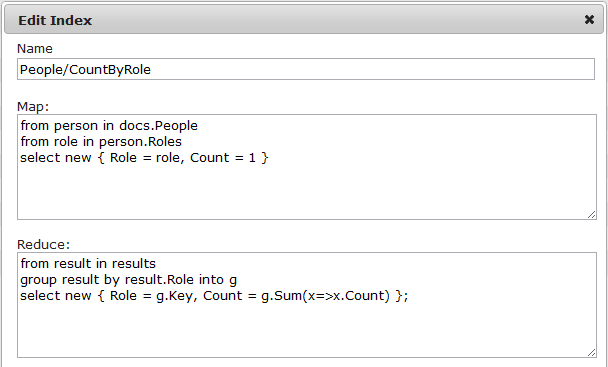 And the hierarchical format allows to manage that sort of hierarchical grouping inside Raven easily. 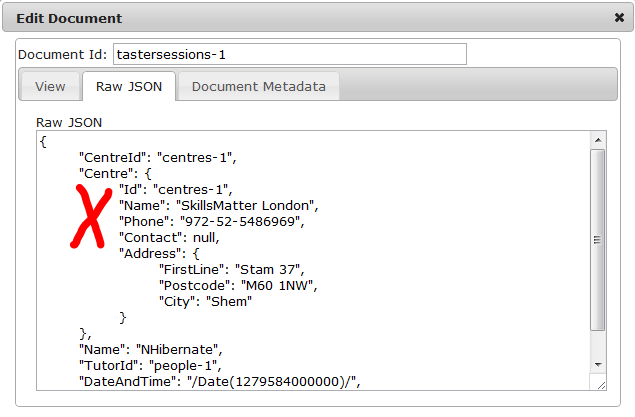 Note that we can also define permissions on the user for documents that are tagged with a particular tag. This is important if we want to grant a specific user permission for a group of documents. Tags, operations and roles are hierarchical. But the way they work is quite different. For Tags and Operations, having permission for “/Debts” gives you permission to “/Debts/Finalize”. For roles, it is the other way around, if you are a member of “/DebtAgents/Managers”, you are also a memeber of “/DebtAgents”. The Authorization Bundle uses all of those rules to apply permissions. I think that it should be pretty obvious by now how the Authorization Bundle makes a decision about whatever a particular operation is allowed or denied, but the response for denying an operation are worth some note. When performing a query over a set of documents, some of which we don’t have the permission for under the specified operation, those documents are filtered out from the query. When loading a document by id, when we don’t have the permission to do so under the specified operation, an error is raised. When trying to write to a document (either PUT or DELETE), when we don’t have the permission to do so under the specified operation, an error is raised. That is pretty much as detailed as I want things to be at this stage. Thoughts? When I wrote RavenDB, I started from the server, and built the client last. That had some interesting affects on RavenDB, for example, you can see detailed docs about the HTTP API, because that is what I had when I wrote most of the docs. In the context of indexes, that meant that I thought a lot more about defining and working with indexes from the WebUI perspective, rather than the client perspective. Now that Raven have users that actually put it through its paces, I found that most people want to be able to define their indexes completely in code, and want to be able to re-create those indexes from code. And that calls for a integral solution from Raven for this issue. Here is how you do this. And that is it, Raven will scan the provided assembly (you can also provide a MEF catalog, for more complex scenarios) and create all those indexes for you, skipping the creation if the new index definition matches the index definition in the database. 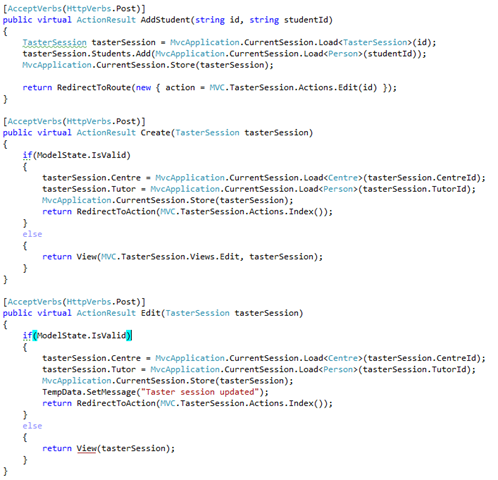 That caused me to stop everything and focus the client’s attentions on the problem that this code can cause. I intend to write a series of posts about NHibernate tooling, and I thought that before I start, I should ask people to point me to tools that I might not be familiar with. Any others that you’ll like me to check out? Nitpicker corner: this post discusses authorization, which assumes that you already know who the user is. Discussion of authentication methods, how we decide who the user is, would be outside the scope of this post. I had a lot of experience with building security systems. After all, sooner or later, whatever your project is, you are going to need one. At some point, I got tired enough of doing that that I wrote Rhino Security, which codify a lot of the lessons that I learned from all of those times. And I learned a lot from using Rhino Security in real world projects as well. When coming to design the authorization bundle for RavenDB, I had decided to make a conscious effort to detail the underlying premise that I have when I am approaching the design of a security system. That seems to be an instinctual response by most developers when faced with the problem, “we will push it to the infrastructure and handle this automatically”. The usual arguments is that we want to avoid the possibility of the developer forgetting to include the security checks and that it makes it easier to develop. Infrastructure related – can I read / write to this document? Business related – can I perform [business operation] on this entity? Very often, we try to use the first to apply the second. This is often the can when we have a business rule that specify that a user shouldn’t be able to access certain documents which we try to apply at the infrastructure level. For a change, we will use the example of a debt collection agency. As a debt collector, I can negotiate a settlement plan with a debtor, so the agency can resolve the debt. Seems simple, right? We will assume that we have a solution in store and say that the role of DebtCollectors can’t read/write to documents about settlement plans of over 50K$. I am not sure how you would actually implement this, but let us say that we did just that. We solved the problem at the infrastructure level and everyone is happy. Then we run into a problem, a Debt Collector may not be allow to do the actual negotiation with a heavy debtor, but there is a whole lot of additional work that goes on that the Debt Collector should do (check for collateral, future prospects, background check, etc). The way that the agency works, the Debt Collector does a lot of the preliminary work, then the manager does the actual negotiation. That means that for the same entity, under different contexts, we have very different security rules. And these sort of requirements are the ones that are going to give you fits when you try to apply them at the infrastructure level. You can argue that those sort of rules are business logic, not security rules, but the way the business think of them, that is exactly what they are. There is another aspect for this. Usually when we need to implement security system like this, people throw into the ring the notion of Row Level Security and allowing access to specific rows by specific logins. That is a non starter from the get go, for several reasons. The previous point about infrastructure level security applies here as well, but the major problem is that it just doesn’t work when you have more than a pittance of users. All Row Level Security solutions that I am aware of (I am thinking specifically of some solutions provided by database vendors) requires you to login into the database using a specific user, from which your credentials can be checked against specific rows permissions. Consider the case where you have a large number of users, and you have to login to the database for each user using their credentials. What is going to be the affect on the system? Well, there are going to be two major problems. The first is that you can wave goodbye to small & unimportant things like connection pooling, since each user have their own login, they can’t share connections, which is going to substantially increase the cost of talking to the database. The second is a bit more complex to explain. When the system perform an operation as a result of a user action, there are distinct differences between work that the system performs on behalf of the user and work that the system performs on behalf of the system. As a Debt Collector, I can finalize a settlement plan with a debtor, so the agency can make a lot of money. A Debt Collector may only view settlement plans for the vendors that they handle debt collection for. Settlement plan cannot be finalized if (along with other plans that may exists) the settlement plan would result in over 70% of the debtor salary going into paying debts. This is pretty simple scenario. If I am collecting debts for ACME, I can’t take a peek and see how debts handle be EMCA, ACME’s competitor, are handled. And naturally, if the debtor’s income isn’t sufficient to pay the debt, it is pretty obvious that the settlement plan isn’t valid, and we need to consider something else. Now, let us look at how we would actually implement this, the first rule specifies that we can’t see other settlement plans, but for us to enforce the second rule, we must see them, even if they belong to other creditors. In other words, we have a rule where the system need to execute in the context of the system and not in the context of the user. You will be surprised how often such scenarios come up when building complex systems. When your security system is relying on the logged on user for handling security filtering, you are going to run into a pretty hard problem when it comes the time to handle those scenarios. You can’t handle authorization in the infrastructure, there isn’t enough context to make decisions there. Relying on the logged on user for row/document level security is a good way to have a wall hit your head in a considerable speed. Authorization must be optional, because we need to execute some operations to ensure valid state outside the security context of a single user. Authorization isn’t limited to the small set of operations that you can perform from infrastructure perspective (Read / Write) but have business meaning that you need to consider.